- See also shorter version on Refugees Deeply. - "The promises and risks of new technology in disaster response. A curated collection of IRIN reporting." - This issue includes 13 articles under the theme of "Forced Migrants and Digital Connectivity." They are organized under three different sub-sections. To locate them, either scroll down or use the ctrl-find function on your keyboard to search for instances of "forced migrants." - Free app that tells "the story of what happens when war comes to a child's bedroom by exploring the space through Augmented Reality." Download iOS version here. 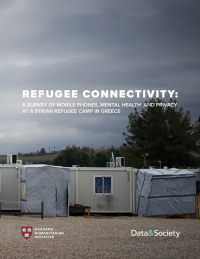 - A "digital initiative focused on providing the humanitarian community with a platform to reach refugees, asylum seekers and crisis-affected communities with critical information in multiple languages." Read the press release for more info.